Designed by the Henri Mignet, the “Pou-du-Ciel” was the result of a long quest for a safe aeroplane that could be built quickly and cheaply by any amateur. His first success was the HM-8, a nearly classic monoplane of which drawings and advices were diffused thanks the book he published himself. After the war, Mignet redesigned the HM-290 and the drawings printed on a single sheet of paper was sold through magazines like the belgian « l’Aéronef ». Many were built through Europe and the better known was the belgian registered OO-11 flown by Fernand Noiset nearly everywhere. Claude Adam from Thuin wanted to improve the design of the Pou-du-Ciel HM-293. He designed a new composite bodied fuselage by lowering the nose and the pilot’s position was now much more comfortable. Combined with a tricycle undercarriage, it looks now very modern. The Croses “Airplume”, designed by Yves Croses, is an ULM evolution of the famous Flying Flea. 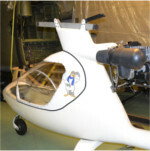 It is a tandem 2 seat machine, with a fiberglass fuselage, originally sold as a kit. The “Airplume” first flew in the sixties and was developed in 3 different versions (EC-1 to EC-3). The OO-504 registered ultralight was at first a Butterfly. It was modified with a completely new wooden fuselage by Michel Rocourt hence the name ROMIBUTTER. Keeping the Butterfly wings and tail, it was registered again OO-504 on 3/2/1987. Aviasud was founded end 1981 by two belgians engineers : François Goethals and Bernard d’Otreppe, both experimented pilots. The Albatros was designed in 1991 ; first as a single seater used by Bernard d’Otreppe on which he won several world records again. In 1983, the Sirocco received the “outstanding design price” at Oshkosh and from september 1984 to march 1987, Patrice Franceschi flew one in a circumnavigation of the earth. Designed by the American aircraft designer Jim Bede and introduced to the market primarily in kit form by the now-defunct Bede Aircraft Corporation in the early 1970s, the BD-5 is an attractive design that looks like a little jet fighter. The 1982 Oshkosh Fly-In edition reveals the Falcon that represented a new generation of ultralights. Its particular design was very attractive and production began in the USA in 1983. The production rights for the rest of the world were sold in 1984 to the SONACA that introduced some modifications like a new nosewheel leg and better wing resistance.